We all bring something to the table with our strengths, both in our personal lives and in our organizations. Wouldn’t it be great if we had a roadmap to identify what those strengths were and put those to the best use in leadership, support, or independent roles at work or home? 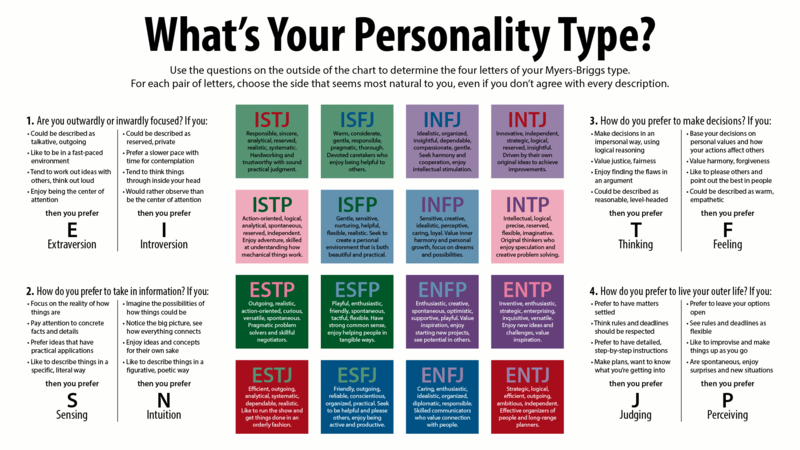 Learn more about the Jungian Personality model (also known as the Meyers-Briggs) below to understand how it fits with training we provide for organizations where personality traits are a dynamic factor. If you have 5-8 minutes, you can get started with this simple and free 16 Types Jungian Personality Test on Psychcentral.com. This test, first published in 1962, was developed by a mother-daughter team of Katharine Cook Briggs and Isabel Briggs Meyers based on the personality theory of Carl G. Jung. Millions of people around the world have taken the test since its first publication. Upon completion of the test, you will receive your distinctive personality type—one of 16 possible 4 letter identifications. Keep in mind that all types are equal; there are no types better or worse than others and they can change over time and by situation! Extraversion (E)/Introversion (I) – Are you outwardly or inwardly focused? Sensing (S)/Intuition (N) –How do you prefer to take in information? Thinking (T)/Feeling (F) – Do you make decisions based on personal values or logical reasoning? Judging (J)/Perceiving (P) – Is structure more important to you or do you leave your options open? Learning your own personality type gives you valuable insights into your own underlying values, motives, and preferences. By raising awareness about yourself and how you interact with other personality types you will truly see your strengths and areas for development. You will become a better team member, learn how to cooperate and collaborate in new ways. You will more clearly grasp the true positive power of diversity of personality. When you are a leader or a manager, knowing your team’s types will inform you how to interact with them, what their needs are, and provide insights into how they would prefer to communicate, and what motivates them. In our experience, wrapping personality assessments in as a pre-cursor to training or teambuilding activities really provides valuable insights to participants and will lead to better outcomes. IPS trainers provide you with detailed reports about your teams’ makeup and then can offer focused trainings applying the 16-types model; those insights change perspectives and behavior. Click this link to find your career fit, college major suggestions, view household income by type and even see your best match in love in Benjamin Snyder’s recent CNBC article. To see an infographic with a short explanation of your personality type click here! For more resources, see the 16personalities website here.